New Delhi, May 7 : The Congress Wednesday flayed BJP prime ministerial candidate Narendra Modi for misinterpreting Priyanka Gandhi's statement on his brand of politics and calling it a caste slur for electoral gain. Congress spokesperson and union minister Shashi Tharoor said the statement made by Priyanka Gandhi had "no bearing" on Modi's caste. He said the statement was made in reference to the "debased level of political discourse" on the part of the Bharatiya Janata Party and its prime ministerial candidate. Amethi, May 1 : Priyanka Gandhi Vadra Thursday said angrily that she was the daughter of late former prime minister Rajiv Gandhi and he cannot be compared to anyone. "My father is Rajiv Gandhi. He laid down his life for the country. He cannot be compared to anyone else," Priyanka Gandhi said in a retort. She was reacting to a reported statement by Bharatiya Janata Party's prime ministerial candidate Narendra Modi that she was like his daughter. Rae Bareli, April 28 : Under attack from the BJP, Priyanka Gandhi Vadra Monday termed the opposition's criticism a "gift" that she chose to reject. Asked about the barrage of criticism by the Bharatiya Janata Party (BJP) of her and her husband Robert Vadra, Gandhi said: "Buddha said you can choose the gift you want to receive." "If they choose to give me those gifts, I can choose to reject. If I reject them, it's theirs not mine," she told TV channel Times Now. Rae Bareli, April 27 : In a jibe at BJP's prime ministerial candidate Narendra Modi, Congress star campaigner Priyanka Gandhi Sunday said a "56-inch chest" was not needed to govern India. "We do not need a 56-inch chest to run this country. We need a heart full of kindness," she told a public meeting here while campaigning for her mother and Congress president Sonia Gandhi. "India does not need a show of one's achievements. She needs strength and determination of the mind," she added. Rae Bareli, April 23 : Politics is about dealing with the problems of the people and "not just making personal attacks", Priyanka Gandhi Vadra said here Wednesday. "Politics is all about the development and problems of the people. Parties should focus on bringing out the solutions for the problems of the people and not just making personal attacks," Priyanka said during a campaign for her mother and Congress chief Sonia Gandhi. She said that political candidates just focus on making personal attacks without talking about the solutions of the problems people face. Rae Bareli (Uttar Pradesh), April 22 : Priyanka Gandhi Vadra Tuesday said that the Congress will "fight back" against all those who have "maligned" the Gandhi family. "There is a change in the way politics is being done in the current elections. My husband and the entire Gandhi family is being maligned. My family is being attacked for the past two Years. My husband has been used for the political attacks. The Congress will fight back with determination," Priyanka said while addressing a rally here. She said that she was saddened by the way politics was being done in the country. Amethi (Uttar Pradesh), April 15 : Priyanka Gandhi Vadra Tuesday slammed estranged cousin Varun Gandhi for the second time in three days, criticising him for siding with the BJP, and "betraying the family". Talking to reporters in Amethi, Priyanka accused the Bharatiya Janata Party candidate from Sultanpur Lok Sabha constituency of "betraying the family". Her remarks came hours after Varun Gandhi gave a warning that his silence should not be construed as weakness. New Delhi, Oct 14 : The Congress Monday denied reports that Priyanka Gandhi will campaign for the Lok Sabha election. "This is an effort to divert attention from the Madhya Pradesh stampede that some people and channels are spreading this rumour," Congress general secretary Ajay Maken said. New Delhi, March 6 : UPA chairperson Sonia Gandhi's daughter Priyanka Gandhi Vadra was discharged from a hospital Wednesday here after she successfully underwent surgery to remove gall stones. "Priyanka Gandhi was discharged from the hospital today (Wednesday)," said sources at the Sir Ganga Ram hospital, where she underwent surgery Monday. Priyanka, 41, was found to have stones in her gall bladder during a routine check-up. She was admitted to the hospital Sunday. Amethi (Uttar Pradesh), Nov 20 Priyanka Gandhi took to the wheel even as elder brother and Congress general secretary Rahul Gandhi sat next to her after the two landed in his constituency Amethi Friday. Priyanka and Rahul reached the Fursatganj airport in Sultanpur district at around 11 a. m. After getting out of the airport, she sat in the driver's seat of the green Toyota Qualis and set out for Amethi to meet Congress functionaries and Women's Self Help Groups (SHGs). Lucknow, Nov 19 : Congress general secretary Rahul Gandhi and his sister Priyanka will Friday visit his parliamentary constituency Amethi in Uttar Pradesh, party sources said. Uttar Pradesh Congress Committee sources said the Gandhis' visit was for "non political" reasons, mainly to interact with self-help groups. Amethi, in Sultanpur district, is about 150 km from Lucknow. Rae Bareli, Apr 27: Priyanka Gandhi, the daughter of Congress President Sonia Gandhi, on Monday hit back at Bharatiya Janata Party (BJP) leader Varun Gandhi, saying people vote for her family members not due to Gandhi surname but due to the work done by them. “Many people ask me why do our family members keep on winning from these seats. Some argue we are Gandhis that’s why we win, but this is not true. Whether the name Gandhi is with us or not you would not have promoted us had we not worked,” Priyanka said at an election rally here. Rae Bareli, Apr 27: Priyanka Gandhi, the daughter of Congress President Sonia Gandhi, on Monday asked people to realize the power of their votes, saying no one can become a leader or get into the government without the support of the people. “By your support, development and change take place. It is important for you to understand it during the polls,” Priyanka Gandhi said at an election rally here. Priyanka Gandhi further said that a leader is a servant of the people and by serving them, the leader does not do any favour. New Delhi, Apr. 25 : Congress party general secretary Rahul Gandhi is an institution builder like his father and former Prime Minister Rajiv Gandhi, claims his sister Priyanka Gandhi Vadra. Revealing this aspect of Rahul's personality to NDTV during an interview, Priyanka also said that her brother was right in consistently saying that he is not ready to be Prime Minister, even if that post were to be offered to him in the near future. Rae Bareli, Apr 23: Priyanka Gandhi, the daughter of Congress President Sonia Gandhi, on Thursday urged people to vote strictly on the issue of development. “Don’t look at any politician as God. Never ever become a worshipper to any politician. Politics will improve only when you will understand that politicians are your servant,” Gandhi said at an election rally here. 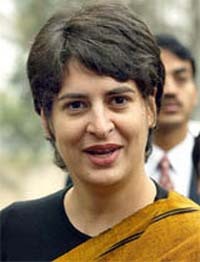 Priyanka further said that it was peoples’ responsibility to make the politicians realise that they want development. Rae-Bareilly (Uttar Pradesh), Apr 22 : Priyanka Gandhi Vadra, the daughter of United Progressive Alliance (UPA) chairperson and Congress president Sonia Gandhi, on Wednesday urged the people of Rae Bareilly to cast their votes keeping in mind the development work done by her mother in the constituency over the years. Addressing an election rally here, Gandhi told the voters not get influenced by the tall promises made by other parties and maintain its belief on the Congress, who has actually brought a change in the area.